Standing in the coffee aisle, I was faced with a dilemma. I've stopped shopping at the Atlantic Center Target because it sullies the good name of Target and does not deserve my money. But oh, the prices. $8 for a two pound bucket of Maxwell House. Said bucket is $13 at Steve's C-Town down here in my hood. What's this? Cafe Caribe? $7 you say? Good price. What if I don't like it? I'll be stuck with two pounds of coffee I can't drink. Wait, that's right. I'm a total addict. If it came down to it I'd dig out yesterday's grounds and filter them with a dirty sock to get my fix. 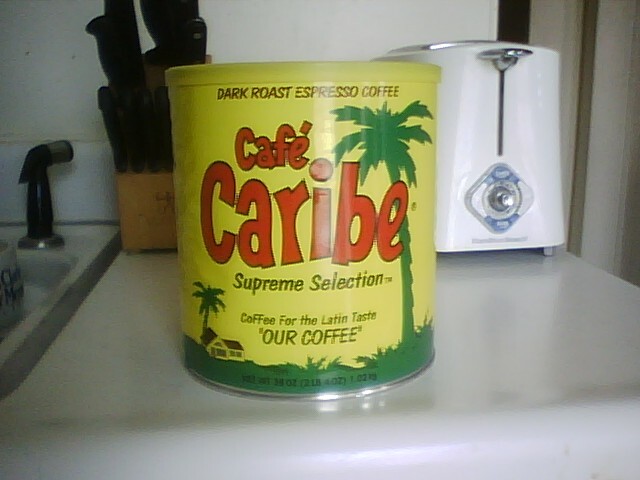 Cafe Caribe, welcome to my household! EDIT: And it's not bad.